How fast are trains in Romania? Romanian trains are so slow, that when you get to a train crossing and you already see the train approaching, you can still safely cross the tracks. Even on a bicycle. 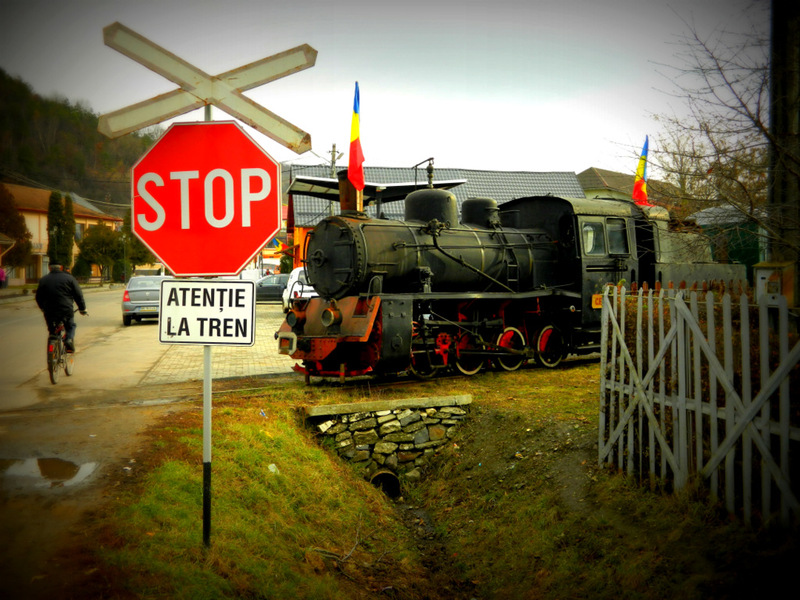 This entry was posted in Photography, Romania, Travel and tagged CFR, train. Bookmark the permalink. 23 Responses to How fast are trains in Romania? While I was traveling around Romania, I took train from Bucharest to Brasov and it took around 5 hours! OMG. The distance between these two cities is 168 km. A month ago I went from Timisoara (in western Romania) to Targu Mures (where I live in central Romania). 340 km on the road. I took the only direct train of the day. I had to get on so early in the morning that it was still dark and when I arrived around 9 hours later, the sun was just about to set. Luckily, I had enough to read with me. But by bus or car it’s not much faster, so I still prefer the train. At least I can stretch my legs, enjoy the view and read a book. But I had to reduce my travel plans for my time in Romania greatly because I had not anticipated how slowly I would get around. Trains are only slow to make the country look larger. I feel like I live in Canada. But to be fair, there are some hills in between. So the train is probably still faster than a bicycle. I just checked the CFR website and it seems to be even worse. I can only find connections between Targu Mures and Sighisoara where you have to change trains and you are traveling almost all day. The bicycle might be faster after all. Yes, well it is really bad which is unfortunate because I love the train.. Switzerland doesn’t complain about their mountains, though..
On another post, a reader recommended the train from Targu Mures to Moldova as a very scenic route.